Home | Blog | What Is Poly Furniture? Even people who are familiar with standard deck furniture aren’t always aware of all the alternatives. They trust their wood chairs and metal tables to hold up against the weather, through hot and cold temperatures, rain, snow, sleet and hail. While this is optimistic, wood and metal aren’t always the best options in the long term. When considering factors such as durability and longevity, these homeowners would benefit far more from poly outdoor furniture. Polyethylene has many unique qualities which distinguish it from other materials on the market, and polyethylene furniture offers many benefits compared to traditional materials. “Poly” is an abbreviation for high-density polyethylene (HDPE), a type of plastic known for its strength. HDPE can withstand extreme temperatures and is easily recyclable. Polyethylene outdoor furniture is made from the recycled plastic of post-consumer waste such as bottles, jugs and containers. Experienced craftspeople sterilize these containers and melt them down, repurposing refuse which would’ve otherwise contributed to a landfill. Through an eco-friendly process free of harmful emissions and toxic chemicals, artisans create something called “poly lumber,” which they then fashion into furniture. They’ve streamlined manufacturing to eliminate the waste and pollutants associated with construction, and their efficiency reflects elsewhere. Since the Amish custom-make their products to order, large warehouses are unnecessary, and by extension, they save a substantial amount of resources in heat, air conditioning, water and electricity. At AmishOutletStore.com, we align our practices with our eco-conscious values, and it shows. You may feel hesitant to consider anything other than what you’re accustomed to. Though poly offers flexibility in its color and style choices, that’s not always enough. In truth, the benefits of polyethylene go far beyond the superficial. Due to its unique makeup and the method of its manufacturing, polyethylene has properties which make it perfect for outdoor furniture. The artistry of the Amish has its own appeal, but when you look beyond the furniture’s appearance, you’ll find poly furniture has special qualities which separate it from its wood and metal counterparts. We’ll detail four of those qualities, looking at the maintenance it requires, its environmental impact, durability and longevity. Maintenance is essential to owning any type of deck or patio furniture, whether you are hosing off wicker, scouring metal or spot-cleaning cushions. To keep their chairs, tables and assorted accents in good condition, you need to address dirt, grime, mold, mildew and pests before they become a problem. Naturally, the same is true of poly furniture, but you have far less to manage than with cedar, pine, cast iron and other more conventional materials. Unlike wood or metal furniture, poly isn’t stained or painted, avoiding some of the issues inherent to those coatings. It won’t need sanding, touch-ups or scraping, resulting in less work for you. Additionally, the Amish treat poly furniture with a UV agent, which prevents its color from fading. Poly is also resistant to mold, mildew and deterioration. It doesn’t attract pests that eat wood, and it doesn’t rust like metal furniture can. With poly furniture, maintenance begins and ends with soap and water. As long as you use a non-abrasive chemical and rinse lightly with a garden hose, you can remain confident your furniture will last. Leave your chairs, tables and other poly items outdoors in any season without worry. The Amish artisans who manufacture poly furniture don’t depend on the power grid to sustain their production. Where large-scale companies mass-produce their inventory — emitting pollution as they expel excess materials — the eco-conscious craftspeople involved with AmishOutletStore.com take a different approach. As we mentioned earlier, the method for developing high-density polyethylene is eco-friendly, doing more to help the environment than it does to harm it. Through repurposing non-biodegradable waste like bottles, jugs and containers, the Amish divert millions of pounds of plastic away from landfills. Many kinds of conventional furniture release toxic chemicals into the air through a process called “off-gassing,” and these volatile organic compounds (VOCs) accumulate over time. In enclosed areas where VOCs can’t escape or circulate, they concentrate, affecting air quality and the health of homeowners. With poly products, off-gassing isn’t a risk. Homeowners who decide on polyethylene can rest assured their furniture is safe. They can also feel a sense of pride in knowing their purchase from AmishOutletStore.com hasn’t contributed to the destructive practice of deforestation, keeping their impact on the planet to a minimum. You need your outdoor furniture to hold up against harsh weather, through all kinds of conditions including strong wind, pounding rain and heavy snow. While furniture made from traditional materials such as wood and metal will maintain its appearance for a short time, environmental stressors will lead to rot and rust. Poly furniture has far fewer vulnerabilities than standard furniture materials. The material isn’t porous, and where wood needs a waterproofing agent to seal it against moisture, polyethylene is naturally resistant. All forms of damage associated with rain and humidity — swelling, shrinking and rot — don’t present an issue. Pests are also a thing of the past, as carpenter bees and termites find no value in the composition of poly furniture. Where they’d otherwise make a meal out of wood chairs and tables, polyethylene is safe from infestations, which are a threat not only to wood furniture but to other susceptible parts of the home as well. In short, high-density polyethylene isn’t the average plastic you may think of when you hear the word. It’s not the flimsy, lightweight type that will tumble and blow away with a passing breeze, but a strong, sturdy variety that won’t crack, splinter, bend or break under the pressures of the outdoors. When wood splinters and metal rusts away, you have to replace your worn and fractured furniture. There’s a point when maintenance is no longer a viable option, when no amount of scrubbing or scouring with a brush will save beaten, broken chairs and tables from a landfill. While poly furniture can seem expensive at first, you save a substantial sum of money in the long run by investing in poly furniture. The projected lifespan of pieces made from polyethylene is lengthier than that of traditional wood furniture, and with proper care and attention, the material will remain strong and beautiful for a very long time. You can expect other savings as well since poly furniture doesn’t require paint, stains or sealers. Most of the expenses associated with more common materials aren’t applicable to polyethylene, such as repairing damage caused by water or infestations from harmful pests. Little by little, poly pays for itself. Many years after purchase, your polyethylene outdoor furniture will retain its structural integrity. The skill and experience of Amish artisans ensure the entire selection from AmishOutletStore.com meets high standards of excellence, whichever piece of poly furniture homeowners choose. Homeowners searching for poly furniture have a broad range of high-quality pieces to choose from, and the chairs, benches, tables, swings, gliders, rockers, dining sets, accessories and accents are all built by hand using time-tested techniques. Here are some of the different options available from AmishOutletStore.com. The Amish combine beauty with functionality, taking the average, unassuming design of a standard chair and giving it new life. The distinct manufacturing process of the high-density polyethylene allows for bright, bold colors like pink and blue, making it an excellent material for those looking for flexibility in their furniture choices. If you enjoy traditional wood tones instead, you will find no shortage of options. AmishOutletStore.com sells chairs for any occasion. If you have a large yard and few ideas, consider a table and poly benches. Your new setup will be the perfect place to have a picnic in the summer, and when guests come to visit, you can move the bench for additional seating. Regardless of aesthetic, there’s a bench for every type of property, and you can choose designs which are simple and stylish or more elegant pieces sure to grab the attention of visitors. Whatever color, height or style you have in mind for your living space, the artisans involved with AmishOutletStore.com can fashion a poly table that complements your other design choices. Whether you intend to use your table to host dinner parties or hold outdoor decorations like potted plants, you can find something to suit your needs and decor, quality assured. With clean lines and beautiful detailing, the artistry is evident in every inch of the material. A hanging porch swing brings charm and a sense of hospitality to a home, and few things are better than sitting outside on a warm summer evening with a glass of iced tea. If you are interested in a traditional wood swing but don’t want to deal with the maintenance involved, a poly porch swing is your best solution. Beyond their functionality, these swings extend the aesthetic potential of a space, allowing you to experiment with cushions and pillows. Gliders and rockers are similar to hanging porch swings and attractive for the same reasons. Many people find them calming, and the smooth, swaying motion is soothing for young children. Like poly porch swings, these gliders and rockers are also maintenance-free, and they’ll hold up under many years of use without cracks or fractures if given proper care, a sign of the skill and expertise involved in their construction. Those who entertain friends on a regular basis will see the benefit in poly dining sets, with their flexible seating and multiple arrangements. Whether you invite two, four or six people over for dinner, it’s easy and effortless to adjust the layout to accommodate everyone. These dining sets feature holes for a patio umbrella, sold with a plug, and both attached and separate seating is available depending on your preference. After you’ve chosen your preferred chairs, tables, swings, dining sets or other poly furniture, complement your selections with accessories and accents made from the same material. If you’d like to mix and match different colors or styles, you might find a combination which looks more appealing, coordinating your benches and gliders with some of the items below in fresh and exciting ways. There are no limitations beyond what you’re willing to try. When you are browsing for outdoor furniture online, looking for chairs, tables and other items for your porch, patio or yard, you’ll likely find wood and metal furniture at the top of your results. It’s expected, as these are typical materials, but they may not be the best materials. In truth, polyethylene ranks high on the list of the best outdoor furniture materials on the market today. Its simple maintenance, eco-friendly features, durability and longevity make it attractive to anyone, and regardless of your design choices, the broad spectrum of poly styles and colors can match any aesthetic. 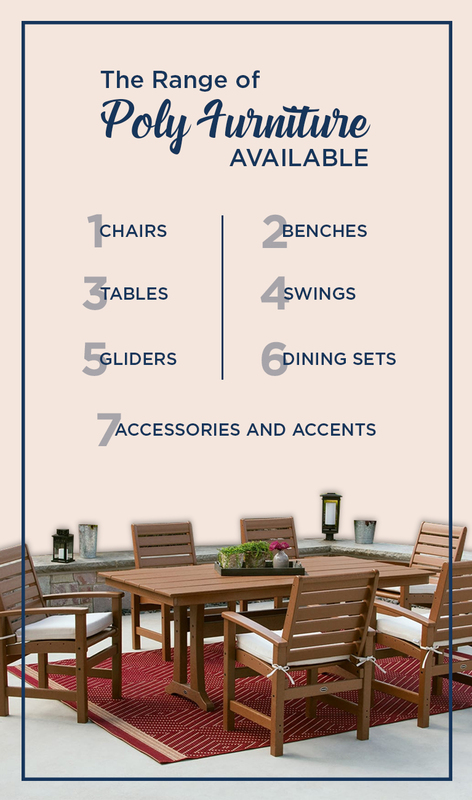 Whether you are interested in a single piece or a poly outdoor furniture kit, you can trust AmishOutletStore.com for the perfect fit. It’s the best place to buy poly outdoor furniture, where expert craftspeople customize a piece to the exact specifications of an order. When you shop at AmishOutletStore.com, you also enjoy up to 33 percent off retail price every day. In addition to these discounts, all poly outdoor furniture ships for free in the United States. To learn more about AmishOutletStore.com and the many benefits of poly furniture for your home, check out the rest of our site. Whether you need something as large as a dining table or small as a planter, we’ll meet and exceed your expectations.